Senate Judiciary Committee Approves Four Intellectual Property Bills, 4/29/2004. April 29, 2004. The Senate Judiciary Committee (SJC) unanimously approved, without amendment, four major bills affecting intellectual property: S 2192 (CREATE Act), HR 1561 (USPTO fee bill), S 2237 (PIRATE Act), and S 1932 (ART Act). The Committee held over S 1933 (EnFORCE Act). Sen. Patrick Leahy (D-VT), the ranking Democrat on the SJC, stated that the SJC may make some changes to HR 1561 before consideration by the full Senate. Also, Sen. Orrin Hatch (R-UT) stated that some or all of these bills may be combined into a single bill. EnFORCE Act. Sen. Hatch announced at the outset that this bill would be held over until a later executive business meeting. He offered no explanation. There was no further debate on this bill. S 1933, the "Enhancing Federal Obscemity Reporting and Copyright Enforcement Act of 2003" (EnFORCE Act), contains six mostly unrelated amendments to the Copyright Act. ART Act. Sen. Dianne Feinstein (D-CA) and Sen. John Cornyn (R-TX), who are sponsors of S 1932 the "Artists' Rights and Theft Prevention Act of 2003" (ART Act), both spoke in support of this bill.. They recited examples of individuals surreptitiously using camcorders at pre-screenings of movies, such as The Passion of the Christ and Kill Bill, and then distributing the recordings on the internet. 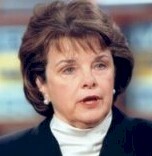 Sen. Feinstein (at right) warned that "this is going to decimate this part of our intellectual property industry in America". She added that for the movie industry "there is no greater priority than passage of this bill". Statutory provisions relating to criminal copyright infringement are found in both Title 18 (criminal code) and Title 17 (copyright act). 17 U.S.C. § 506 contains the criminal prohibition on certain acts of copyright infringement. 18 U.S.C. § 2319 provides penalties for violations of 17 U.S.C. § 506. First, this bill would add a new Section 2319B to the criminal code prohibiting the unauthorized recording of motion pictures in a motion picture exhibition facility. Second, the bill would revise both 18 U.S.C. § 2319 and 17 U.S.C. § 504 to make it easier to prosecute, and obtain civil remedies for, certain acts of copyright infringement. See also, story titled "Senators Introduce Bill to Increase Protection of Pre-Released Movies and Other Unpublished Works" in TLJ Daily E-Mail Alert No. 786, November 25, 2003. USPTO Fee Bill. The Committee approved HR 1561, the "United States Patent and Trademark Fee Modernization Act of 2004" without amendment. However, Sen. Leahy stated that there may be some changes in the version of bill that will be considered on the Senate floor. He did not identify what these changes might be. There was no further debate or discussion of this bill. Although, at the beginning of the meeting, while waiting for a quorum of Senators to arrive, Sen. Hatch praised this bill. CREATE Act. The SJC also approved, without amendment, and without debate, S 2192, the "Cooperative Research and Technology Enhancement Act" (CREATE Act). This is a non-controversial bill to promote collaborative research. The House passed its version of the bill, HR 2391, on March 10, 2004 by a voice vote. See, story titled "House Passes CREATE Act" in TLJ Daily E-Mail Alert No. 854, March 11, 2004. Sen. Orrin Hatch (R-UT), the Chairman of the SJC, Sen. Patrick Leahy (D-VT), the ranking Democrat on the SJC, and others, introduced S 2192 on March 10. PIRATE Act. Finally, the SJC approved, without amendment and without debate, S 2237, the "Protecting Intellectual Rights Against Theft and Expropriation Act of 2004". The bill has two provisions. First, it would authorize the Department of Justice (DOJ) to bring civil actions for copyright infringement for conduct that already constitutes criminal copyright infringement under 17 U.S.C. § 506. This would accomplish two things. It would make it easier to prevail, because, among other things, the civil action would have a lower burden of proof. It would also provide a less punitive action for youthful P2P music pirates. Second, the bill would establish a training program (and authorize funding of $2,000,000) to educate DOJ and U.S. Attorneys Office personnel in copyright enforcement matters.